Iranian drone passes by USS Nimitz aircraft carrier in the Persian Gulf. 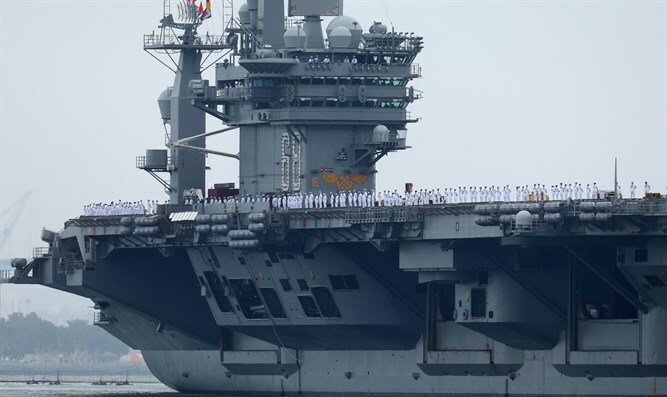 An Iranian drone made several passes by the USS Nimitz aircraft carrier in the Persian Gulf on Sunday, The Washington Post reported on Monday. This is the second such incident in a week and described by the Navy as unsafe, unprofessional and dangerous. The unmanned aerial vehicle (UAV) made the passes by the Nimitz while the aircraft carrier was in international waters and carrying out operations with jets on its flight deck, said Navy Lt. Ian M. McConnaughey, a service spokesman in the Middle East. The drone, an Iranian QOM-1, moved in despite the Navy making repeated radio calls to establish communications, and it came within 1,000 feet of U.S. aircraft, he said, according to The Washington Post. “The failure of the Iranian UAV to utilize standard, internationally-mandated navigation lights during a nighttime approach of a U.S. aircraft carrier engaged in flight operations created a dangerous situation with the potential for collision, and is not in keeping with international maritime customs and laws,” McConnaughey said in a statement. Just last week, an Iranian drone nearly collided with a U.S. Navy F-18 Super Hornet while the American jet was in a holding pattern in the Persian Gulf. In that incident, the Super Hornet maneuvered out of the way, creating lateral separation of about 200 feet and vertical separation of about 100. McConnaughey said Monday that there have been 14 incidents between U.S. and Iranian naval forces this year in which the U.S. military labeled something the Iranians did as unsafe and unprofessional. The QOM-1 drones have only become a problem recently, officials added. “While the use of UAVs has become more prevalent in the region, these two occurrences are the only UAV-related unsafe and unprofessional interactions that we are tracking,” McConnaughey said, according to The Washington Post.